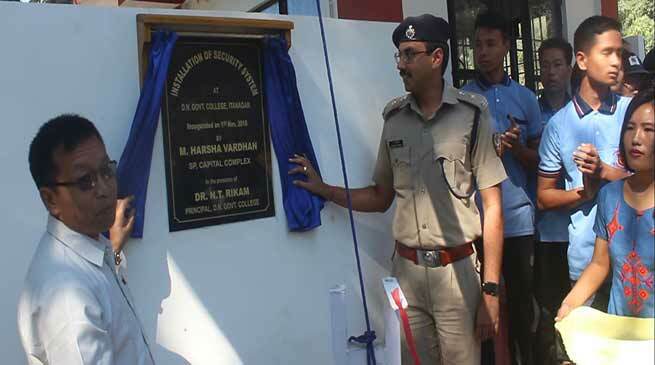 The Capital Complex Superintendent of Police M. Harsha Vardhan today inaugurated a security system installed at Dera Natung Government College, Itanagar , presents of DNGC principal Dr. NT Rikam. On this occasion SP Vardhan appreciated the initiatives taken by the college authority for installation of security system at College by own expense, for the safety and security of the college. He said that these kinds of initiative to be inspired other and he express happy that college authority has taken all the steps which police suggested to everyone to think for their own security up certain level by taking some security measures like installation of CCTV camera, hire privet security personnel. He also requested the college authority to adopt those rules which can be common and agreed by all in like entry and exit timing of the college campus so that there should be no any misunderstanding with security personnel. Further, he also assured that police is ready help any time in required and he also assure to include college gate points to one stoppage of police patrolling (PCR van) and patrolling team will visit twice in night. On the occasion college principal Dr.Rikam said that the security cell is very much need in the collage, because there is lots of disturbance due to heavy traffics and easy entry and exist within collage campus by the outsider who has no any works in college. He also informed that the security cell and our long pending demand were able to managed by own with the help of every one like college staff, students and also alumni of the college. For security we have hired five private security personnel from the private agency though MoU with security agency. And also we install the CCTV camera in entry gate of college campus to monitor any kinds of unwanted activities.